The candidates must be at least 17 years old or not more than 25 years old to apply for the NEET examination. The NEET application is done only through online basis only. Candidates must visit NEET website to get the online application form. Create an account by using username and password to register your self for the Exam. fill out the form with detail information as asked in the application form. Then scan the photograph, signature and Thunb impression of the candidates which should be in jpg format and must be 10KB to 100KB. Then make an application fee payment through Debit card/ credit card or e-challan by depositing fee in any of branch of ICICI/HDFC/SBI. 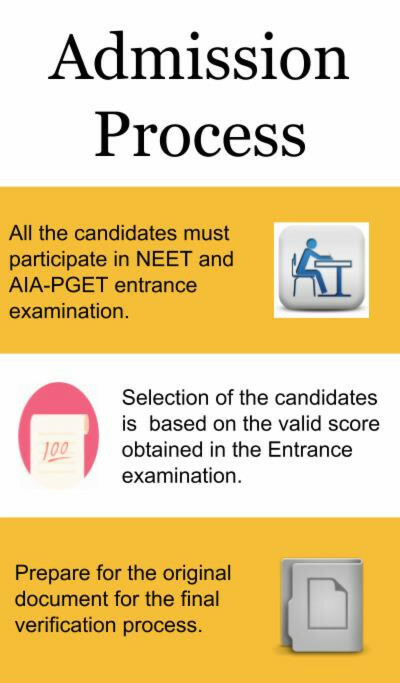 Any candidates interested to join in MD courses must conduct an AIA-PGET Entrance exam. The candidates can get the application link by visiting the official website of AIA-PGET Entrance exam. Once getting the page click on "Click here for New Registration" and fill out the details asked in the form. Then the candidates need to upload the recent photograph and signature in the correct format, size, and dimension. after filling all detail then click on " save and next" button to proceed further. Then the last step is to pay the application fees through online mode by using Debit/Credit card or by net banking. After payment of required fee then the candidates will be direct to the confirmation page and click on "application print". For those student taking admission in the MD Degree is fully based on the AIA-PGET entrance examination. The selection of candidates is done after going through all the application process with valid score in the entrance examination, satisfying all detail qualification and verification of necessary documentation. The minimum eligibility for the student to get admission in the MD courses is to have a BHMS Degree from any recognized University. A person should be 12th passed with PCB subjects to get admission in BHMCAH. CPMEE is the examination conducted where there is no particular Cut Offs as they haven't even showed the scored marks. (Only pass was written). You can apply here after 12 class with minimum 60% marks in biology mains. you have to clear the entrance examination conducted by the college itself for the admission.